When Gov. 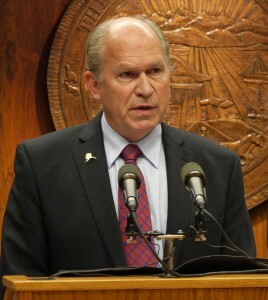 Bill Walker held a press conference in February to announce changes coming for the Alaska LNG gas line project, he left most observers scratching their heads. Standing beside representatives from the state’s three partners – ExxonMobil, BP, and ConocoPhillips — Walker said he hoped to release more details in March. Today, Walker said he doesn’t expect to have any update for the public before April, as negotiations between the state and its partners continue. In February, the governor and oil companies said they were “exploring options” to keep the project going at a time of low oil and gas prices. As for what, exactly, that means – it’s still not clear. The original goal was to hammer out agreements between the state and companies for lawmakers to vote on this spring — and to put a constitutional amendment on the ballot this fall, to lock in tax rates for the pipeline. The administration believed that amendment would be necessary before the partners could decide whether to enter the next phase of the project (called FEED, or Front End Engineering and Design) in 2017. But slow negotiations, crashing oil prices, and a weak natural gas market have combined to throw that timeline into question. Walker said today it’s clear there will be no amendment vote this year (constitutional amendments must appear on a general election ballot, meaning the next opportunity would be 2018). But, he said, he believes there’s a way forward without it — and he is adamant the project must still aim to come online, as planned, in the mid-2020s. The question is whether that’s still realistic, especially for a so-called “gigaproject” expected to cost $45-$65 billion. Larry Persily, an adviser to the Kenai Peninsula Borough, just returned from a conference of liquified natural gas producers and buyers in Singapore. “The main takeaway is the market has gotten worse in the past year, not better,” he said. With new projects coming online around the world, there is too much supply chasing too few customers, driving down natural gas prices. Analysts expect the market will need new suppliers in the middle of the next decade, Persily said, but there are a lot of projects competing to meet that need. Alaska can only compete if it can keep costs very low. That may be what the state and its partners are trying to figure out – for now, behind closed doors.